Toronto, Ontario--(Newsfile Corp. - August 2, 2018) - Appia Energy Corp. (CSE: API) (OTCQB: APAAF) (FSE: A0I.F) (FSE: A0I.MU) (FSE: A0I.BE) (the "Company" or "Appia) is pleased to provide an update on the summer exploration work (the "Program") currently being carried out on the Alces Lake Property (the "Property") in northern Saskatchewan. The Kubota KS-121 excavator has been re-assembled and is in operation, the diamond drill re-assembly is near completion, and a high pressure water pump is being used to wash outcrops of remaining overburden sedimentary cover. 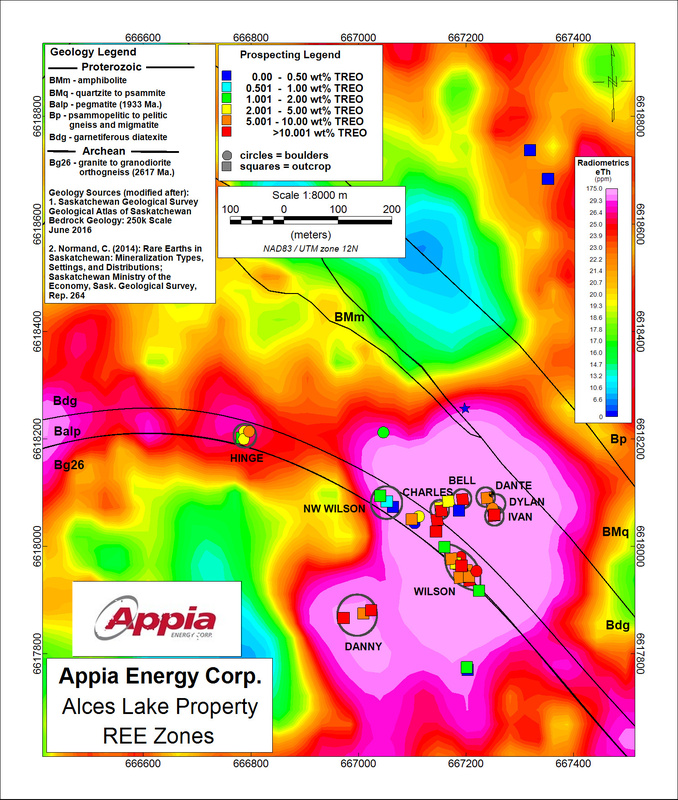 The Alces Lake Property encompasses some of the highest-grade total and critical rare earth element ("REE") mineralization in the world, hosted within seven surface showings that remain open in all directions (see *Note below). Critical rare earth elements are defined here as those that are in short-supply and high-demand for use in permanent magnets and modern electronic applications (i.e., Nd, Pr and Dy). The Property is 1,518 hectares (3,751 acres) in size. Figure 1 displays all REE zones uncovered to date on the Property. The Company has uncovered the surface mineralization showings at the Charles zone, in addition to completing geological mapping and photography, detailed radiometric surveying, and channel sampling. The Company has delivered a total of 223 samples from channel sample intervals to the Saskatchewan Research Council's Geoanalytical Laboratories in Saskatoon, SK. Results are expected in 2 to 4 weeks. Diamond drilling is scheduled to begin shortly to test for REE mineralization at depth. The Charles zone is currently defined as two zones separated by the Charles-Bell fault; the north-south oriented zone is continuous over a strike length of 16.5 m by 1.2 m to 4.9 m wide (average 2.8 m), and the east-west oriented zone is continuous along 19.0 m strike length by 1.5 to 7.0 m wide (average 4.9 m). An outcrop sample (taken in 2011 from the north-south Charles zone) returned 16.1 wt% Total Rare Earth Elements ("TREE"). The Bell zone has been partially uncovered; however due to topographical constraints the eastern limits of the REE mineralization remain covered with sediment and water. Geological mapping, photography, and detailed radiometric surveying have been initiated, but still require additional work. The Bell zone is currently defined over a strike length of 14.0 m in the east-west direction by 0.3 to 4.0 m wide. The Bell zone remains open to the east. An outcrop sample (taken in 2010 from the Bell zone) returned 17.6 wt% TREE. Overlying sedimentary cover has been removed from parts of the Wilson and Ivan zones, and washing and detailed radiometric surveying is on-going. REE mineralization is currently defined along 57.0 m and 14.0 m strike lengths at the Wilson and Ivan zones, respectively; mineralization is still open in all directions. Channel samples taken from the Wilson and Ivan zones in 2017 returned a maximum of 28.67 wt% Total Rare Earth Oxide ("TREO") over 0.5 m and 52.26 wt% TREO over 1.2 m, respectively. Two additional zones of REE mineralization, "Dante" and "Dylan", with >10,000 cps have been exposed northwest and north of the Ivan zone. Additional work is required on both zones. Figure 2 provides an aerial view of the six zones discussed above and shows that most of the area remains covered by trees and overburden materials. Geochemical and radiometric results will be announced as they are received and reviewed by the Company. The Company is hopeful that it will be in a position to produce a NI 43-101 compliant Inferred Mineral Resource estimate by year end 2018. All necessary permits for the Program are in-hand. A lead-shielded RS-125 scintillometer was used to measure radioactivity readings. The reader is cautioned that Appia uses scintillometer field readings only as a preliminary indication of the presence of radioactive materials (uranium, thorium and/or potassium), and that scintillometer results may not be used directly to quantify or qualify radioactive mineral concentrations of the rock samples measured. Background radioactivity measured on the Property range from 100 cps to 500 cps. Low and high levels of radioactivity are defined here as 1,000 to 10,000 cps and >10,000 cps, respectively. Appia is a Canadian publicly-traded company in the uranium and rare earth element sectors. The Company is currently focusing on delineating high-grade critical rare earth elements ("REE") and uranium on the Alces Lake property, as well as prospecting for high-grade uranium in the prolific Athabasca Basin on its Loranger, North Wollaston and Eastside, properties. The Company holds 100% of the surface rights to exploration over 51,164 hectares (126,430 acres) in Saskatchewan. The technical content in this news release was reviewed and approved by Dr. Irvine Annesley, Ph.D., P.Geo, a Consultant to the Company, and a Qualified Person as defined by National Instrument 43-101. Figure 1: Location of the 9 REE zones on the Alces Lake property. The Dante and Dylan zones are the newest identified zones to date. 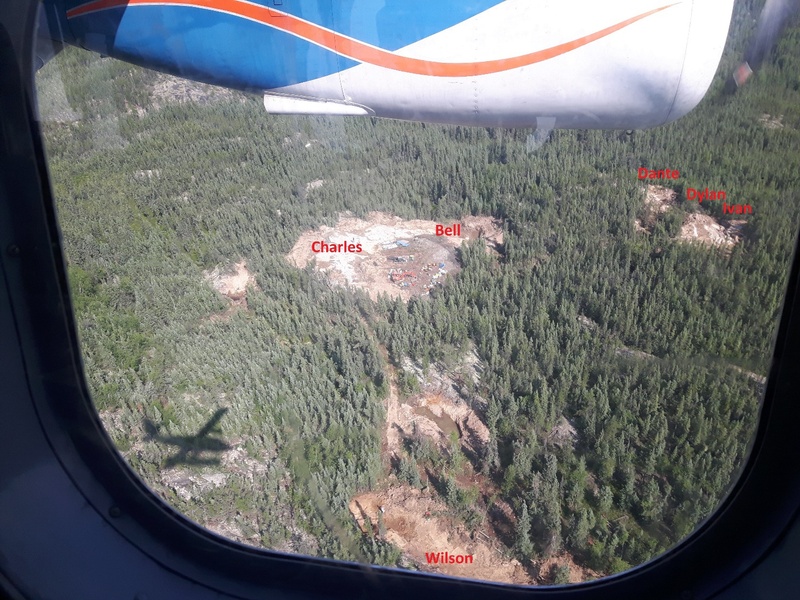 Figure 2: Aerial view of excavating to-date on 6 REE zones at Alces Lake. No scale available.